Isolated unilateral erythema elevatum diutinum: a case report. Department of Dermatology, Seth G.S. Medical College & KEM Hospital, Parel, Mumbai 400012-India. A 35 year old married female presented with asymptomatic swellings over lateral aspect of right foot since 1 year with occasional pain gradually increasing in size. There was no history of any other complaint. Rest of cutaneous and systemic examination including eye examination was within normal limits. Biopsy from one of the lesion was pathognomonic of erythema elevatum diutinum(EED). The patient was treated with oral dapsone with good response within 6 months. Erythema elevatum diutinum (EED) is a rare, form of cutaneous leukocytoclastic vasculitis, characterized clinically by red-to-yellow-brown papules, nodules, and plaques, typically affecting extensor surfaces and the dorsal aspects of joints in a symmetric distribution. EED may be associated with several immunological and infectious diseases, collagen vascular diseases, hematological disorders, inflammatory bowel disease, B-Cell lymphomas, Myeloproliferative disorders. Unilateral EED is a rare occurrence. We report a case of isolated and unilateral EED treated successfully with oral dapsone therapy. 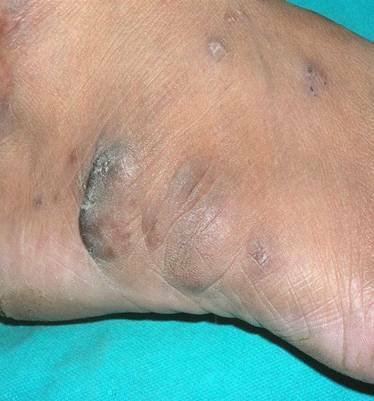 A 35-year-old female presented with history of asymptomatic brownish raised lesions over the lateral aspect of right foot of one year duration. There was history of gradual increase in the number and the size of the lesions. The lesions were not associated with itching and burning sensation or pain. There was no history of preceding or associated upper respiratory tract infection, gastro-intestinal disturbances, fever and malaise. She was not a known diabetic or hypertensive and had no past history of tuberculosis or contact with tuberculosis. On examination her vital parameters were within normal limits. There were multiple unilateral brownish nodules on the lateral aspect of right foot (Fig 1). No similar lesions were seen anywhere else. The nodules were brownish, smooth surfaced, firm in consistency, non-tender and not fixed to the underlying tissues. There was no significant lymphadenopathy, hepatosplenomegaly or joint deformity or any eye complaint. Fig 1: Multiple brownish nodules over right lateral foot. 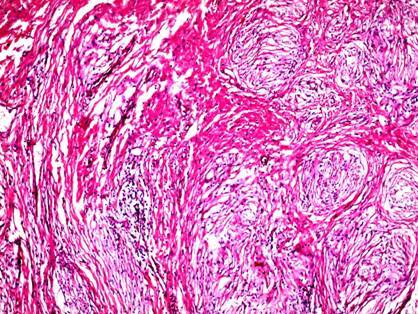 The differential diagnosis of Keloid, fibromatosis and late stage Kaposi's sarcoma were thought and patient was investigated. The complete hemogram, blood biochemistry, X-ray chest and electrocardiogram were normal. ASLO titer was normal and throat swab did not show any growth. The tests for rheumatoid factor, ANA, dsDNA as well ELISA for HIV were negative. Serum IgA, IgG and IgM levels were within normal limits. Urine examination for Bence-Jones proteins was negative. Eye examination revealed no abnormality. Skin biopsy from a nodule revealed normal epidermis and a circumscribed dense dermal infiltrate of predominant neutrophils with few lymphocytes, eosinophils especially in the perivascular areas with fibroplasia and thickening of collagen (Fig 2,3). 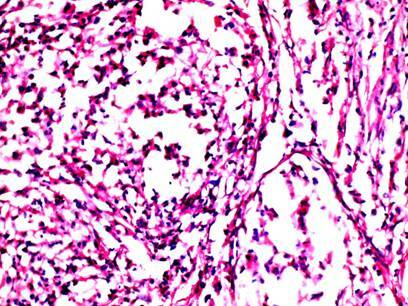 The blood vessels showed endothelial cell swelling, infiltration of walls with neutrophils, extravasation of erythrocytes and perivascular nuclear dust and perivascular fibrosis (Fig 4). 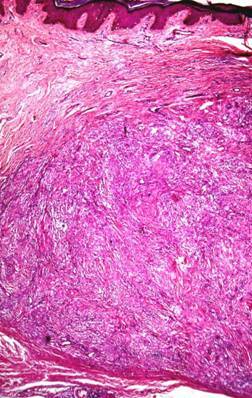 Fig 2: A circumscribed collection of inflammatory infiltrate in dermis with fibroplasia. (H&E, 25X). Fig 4: The infiltrate invading vessels shows neutrophils with nuclear dust. (H&E, 400X). On clinico-pathological correlation the final diagnosis of unilateral isolated erythema elevatum diutinum (EED) was made. The patient was started on 100 mg of dapsone daily at bed time. A significant flattening of the lesions was noticed by the end of six months of therapy (Fig 5). Fig 5: Nearly complete flattening of lesions after 6 months of dapsone therapy. Dapsone is the treatment of choice with good therapeutic response as was seen in our case. Various other drugs like colchicine, sulfapyridine, niacinamide and tetracycline and steroids either topical, Intralesional or oral have been used with variable success. Most important part of treatment is to unmask any serious systemic disease. Patients with IgA gammopathy may need intermittent plasma exchange in addition to above measures. Our case showed good response to oral dapsone had no any systemic association and lesions were unilateral, which is rare in EED. 1. Farley-Loftus R, Dadlani C, Wang N, et al. Erythema elevatum diutinum. Dermatol Online J. 2008;14:13. 2. Sachdev DS, Kharkar VD, Mahajan SA, Gupte PD. Erythema elevatum diutinum. J Postgrad Med. 2002;48:310-311. 3. Nair SR, Viswanath V, Sonavane AD, et al. Erythema elevatum diutinum with verrucous carcinoma: a rare association. Indian J Dermatol Venereol Leprol. 2010;76:420-422. 4. Tomasini C, Seia Z, Dapavo P, et al. Infantile erythema elevatum diutinum: report of a vesiculo-bullous case. Eur J Dermatol. 2006;16:683-686. 5. Gibson LE, el-Azhary RA. Erythema elevatum diutinum. Clin Dermatol. 2000;18:295- 299. 6. Futei Y, Konohana I. A case of erythema elevatum diutinum associated with B-cell lymphoma: a rare distribution involving palms, soles and nails. Br J Dermatol. 2000;142:116-119.